An Amsterdam based band, previously called September. Musicians included: Jan de Hont (later with Netherlandss own Hoop Express - translated as "Hope Express", and Music Garden), Adrie de Hont, (later with Alexander Curly's Flying Circus and Maggie MacNeal), Wim de Vries (later with Mayflower) and Dennis Whitbread (later with Flying Circus and Music Garden). Whitbread was replaced by Jerry Gobel (ex-Angelflight Railways, later with Carlsberg) during the recording of their LP. The Maskers was a hard rock group. In the wake of their split in 1970, Jan de Hont (guitar, vocals) Ador Otting (vocals, keyboards) were replaced in 1971 by Hessel de Vries (ex-Angelflight Railways)! Ador later played in Pandemonium. Frans Smit (drums, ex-Maskers), went on to join Brainbox, and was replaced in 1970 by Dennis Whitebread, ex-Ekseption); Wim de Vries (vocals, bass, ex-Sharks & Me) also joined. Later on, yet another guitarist Adri de Hond joined te band. In 1972, the band changed their name to Cargo. September was a band based in Amsterdam, founded around 1970 by three former members of Anno Nu, itself, in turn, comprised of former members of The Maskers and The Whiskers. The first line up was: Jan de Hont (voice/guitar), Ador Otting (keys), Willem de Vries (voice/bass), Frans Smit (drums, ex-Graaf X (Count X) and Klimax). 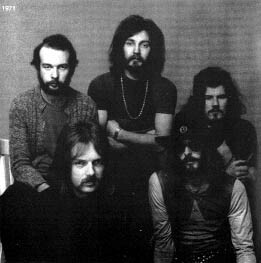 This line-up recorded a single for Imperial, "Little Sister"/"Walk On By". It became a minor hit in the Netherlands but left no permanent impression. Frans Smit left the band to join Brainbox; at the end of 1970, he was replaced by Jerry Göbbel. In 1971, Hessel de Vries (ex-Angelflight Railways) replaced Ador Otting. Jan's brother Adri de Hont was added as an extra member. This line-up produced yet another single, "Jelly Rose"/"If Mr. Right Comes Along". The third single, "Chocker"/"Lydia Purple"was recorded without De Vries and Göbbel (who was replaced by Dennis Whitbred, ex-Het and Ekseption). In 1972, September changed their name to Cargo. The change in name indicated also a change in musical direction for the band. They transitioned from a singles band to a "serious" rock band, focusing now on long, mostly instrumental passages. The alternating lead guitars of Jan and Adri became reminiscent of Wishbone Ash. Also the very crafty and elaborate drumming of Dennis Whitbread drew plenty of attention. Under this monicker, they made one (eponymous) album containing only four very long tracks. It was received favorably by the Dutch press but sales-wise unfortunately didn't amount to much. This lack of recognition is presumably the main reason why the band broke up by the end of 1972.